GOODFELLOW, Dorothy Gladys (née Burtt)... Passed away peacefully at Seasons Dufferin Centre, Trenton on Tuesday, April 9th, 2019 at the age of 92. Beloved wife of the late Stanley Goodfellow. Loving mother of Nancy Mattis & her husband Donald of Consecon, Bonnie Candler & her late husband Jerry of Foxboro and the late Michael Goodfellow & his surviving wife Margaret Ann. Proud and loved grandmother of 7 grandchildren and 7 great grandchildren. Cherished sister of Bill, Eileen, Norma, Ted and the late Jim and Florence. Dorothy will be truly missed by nieces, nephews, extended family and many friends. Family will receive friends at WEAVER Life Centre - East, 29 Bay St. Trenton on Monday, April 15th, 2019 from 12-1 PM. A Funeral Service will take place at 1 PM. Reception to follow. A Spring Interment will take place at Mount Hope Cemetery, Brighton. In lieu of flowers, a donation may be made to CNIB or Quilts of Valour. 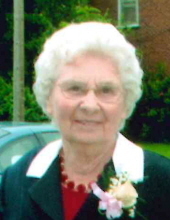 "Email Address" would like to share the life celebration of Dorothy Gladys Goodfellow. Click on the "link" to go to share a favorite memory or leave a condolence message for the family.